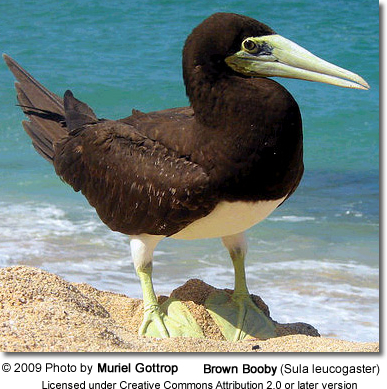 A booby is a seabird in the Sula genus, part of the Sulidae family. 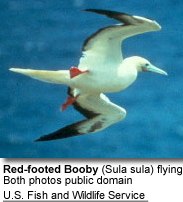 Boobies are closely related to the gannets (Morus), which were formerly included in Sula. Their name was possibly based on the Spanish slang term bobo, meaning "dunce", as these tame birds had a habit of landing on board sailing ships, where they were easily captured and eaten. Owing to this, boobies are often mentioned as having been caught and eaten by shipwrecked sailors, notably Captain Bligh of the Bounty and his loyalists, during their famous voyage after being set adrift by Fletcher Christian and his mutineers. Boobies are large birds with long pointed wings and long bills. They hunt fish by diving from a height into the sea and pursuing their prey underwater. Facial air sacs under their skin cushion the impact with the water. 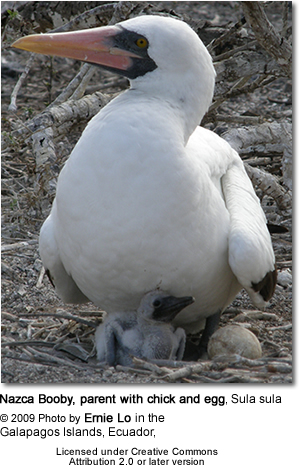 Boobies are colonial breeders on islands and coasts. They normally lay one or more chalky-blue eggs on the ground or sometimes in a tree nest. Five of the six extant Sulidae species called "boobies" are in the genus Sula, while the three gannets are usually treated in the genus Morus. 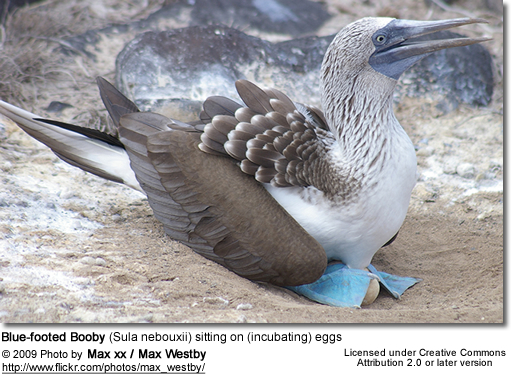 Abbott's Booby was formerly included in Sula but is now placed in a monotypic (only one species) genus Papasula which represents an ancient lineage perhaps closer to Morus. Some authorities consider that all nine species should be considered congeneric in Sula. However, they are readily told apart, by means of osteology. The distinct lineages of gannets and boobies are known to have existed in such form, since at least the Middle Miocene, c.15 mya (Olson 1985). The fossil records of boobies are not as well documented as that of the gannets; possibly because the species of boobies were less numerous in the late Miocene to Pliocene, when gannets had their highest diversity or due to the more tropical distribution of boobies, many fossil species have simply not been found yet, as most localities are in continental North America or Europe. Tasman Booby, Sula (dactylatra) tasmani - possibly extinct (c.1790?) 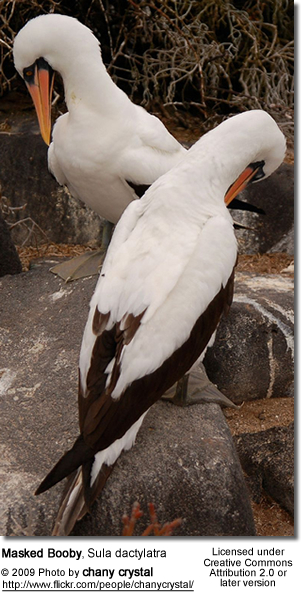 : The Tasman Booby (Sula (dactylatra) tasmani) was a large seabird of the gannet family, Sulidae, described from bones found on Norfolk and Lord Howe Islands in the Tasman Sea (van Tets et al 1988). It was believed to have become extinct in the late 18th Century or early 19th Century on Lord Howe Island because of predation by visiting sailors, with the last sight record dating from 1788, when it was already extinct on Norfolk Island. However, this taxon has more recently (Priddel et al 2005) been considered to be a subspecies of the Masked Booby, Sula dactylatra tasmani, still extant as a breeding species on Lord Howe Island. Holdaway and Anderson (2001) attribute subfossil material from Norfolk Island simply to Sula dactylatra. Copyright: Wikipedia. This article is licensed under the GNU Free Documentation License. It uses material from the Wikipedia.org. ... Additional information by Avianweb.